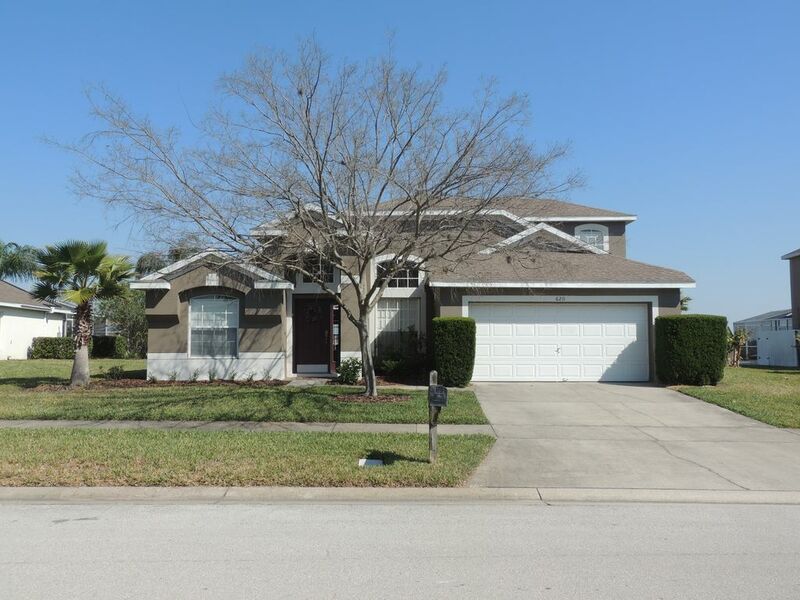 Stay in our stunning 5 bedroom 3 bath home located in the prestigious community of Hampton Lakes, only 15 minutes from Disney. In 2008, we renovated our spacious 2573 square foot home, built in 2000, with new carpets in all the bedrooms, new tile in the rest of the house and new paint throughout. To enhance your vacation experience, our home has been furnished to a very high standard. Relax in our air conditioned home that offers one King-sized Master Suite with a large garden tub and separate shower, complete with cable TV, one Queen Master Suite with shower and cable TV, two bedrooms with twin beds sharing a third full bathroom, and a fifth upstairs loft bedroom with a Queen bed and day bed complete with cable TV. Enjoy the open floor plan that offers spacious areas for family gatherings, whether its the living area as you first enter the house or the family room with its 47 inch flat screen TV and home entertainment system. Choose to eat your breakfast at the breakfast bar or the raised kitchen table. A separate dining area awaits you for a more formal eating area. Our fully equipped kitchen offers a refrigerator/freezer, stove, microwave, and dishwasher, along with all the other kitchen essentials. Entertain yourselves in our garage converted to a gamesroom where you can play a game of pool or table tennis. Enjoy our large heated pool (heating extra) and oversized deck area along with the covered lanai. Relax in our new 4-5 person hot tub after a busy day at the theme parks. Watch the hot air balloons land from your deck chairs or chaise lounges, or enjoy the fireworks at night. No smoking in the house, and no pets please. Marlene and I are from Ontario, Canada, and our family has always enjoyed traveling. We would often escape the cold weather and go to the Orlando area in Florida as there is so much to do here. We found that staying in vacation homes gave us the best value for our money and provided the space and privacy that we enjoyed. These vacation experiences gave us an excellent foundation in choosing our very own vacation home. The location we bought was an area we were familiar with and we knew it was central to the many activities in the Orlando area. The community is a well-kept area with its own tennis courts and volleyball courts, as well as a community pool and children's play area. Golf, shopping and restaurants are also close by. We really love the location of our house. There are no neighbours at the rear of our property as we overlook a dry rention pond and open fields. We can see the Disney fireworks in the distance from our pool deck at night. We find our location to be a very peaceful setting and we are just a short walkfrom the community tennis, volleyball & basketball courts. We were a party of 6 men travelling to Orlando for a golf trip. I compared prices, location, and accommodation of many similar properties on different rental sites over a period of 2 months and I must say that this property was exactly what we were looking for at the most reasonable rate. It had everything that we needed including private pool and hot tub. Bill and Marlene were easy to deal with and the property management company was excellent. 4 golfers had a nice stay, but the house needs a little TLC. The good, house is in a quite neighborhood with a big open field behind the house, pool was nice and warm, plenty of towels, and the house has a nice bedroom layout, electric recliners were awesome. The "needs work":. One of the bedrooms is missing a vertical blinds, hot tub did not work after two calls we gave up, and the kitchen appliances need a thorough cleaning. Another wonderful month in Florida. Thanks! Our stay was nice. Everyone had a bedroom of their own and it was perfect having 2 master suites! We had some trouble with the air not working the first 2 days. The property manager was called, tried to fix it and brought over 1 fan. The king master bedroom has a ceiling fan, the queen master has a oscillating fan, and we had 1 fan in a closet. There were not enough fans for all the bedrooms. She said she would check back the next morning and we never heard from her. We called her again in the evening because the air still was not working right and a repairman came right out and ended up adding freon. The hot tub was finicky and it also took the property manager a few days to get that straight. It would be nice to see some improvements of ceiling fans in all bedrooms and the ceiling fan in the living room was too loud to use. Overall it was nice place to stay, it just would've been better for faster property management response and to have ceiling fans and bedroom lights that turn on by light switch and not lamps. However the home owners were very nice and always responded promptly to emails and messages. We are sorry that the air conditioner wasn't working for you! Unfortunately it is hard to get same day service when the day is scheduled already. We hadn't heard that the fans were an issue, so we have made our management company aware of it. We recognize that the hot tub can be finicky if the directions for use aren't carefully followed. We were at our house the month before to make sure everything was in good working order for our guests, so it is frustrating to see these issues arise. This house is extremely nice. You have so much space, enough room for everyone! It is closer to Disney than Universal. I would definitely stay here again! Overall the space and set up, pool etc. was great for the price. It worked well for my family. However, the house is not being well maintained and was not clean. We spent vacation time to clean up the house, even changing all the clocks to the right time. The home could be great if it was taken care of better! Close to all major attractions such as Disney's 4 theme parks, Sea World, Universal Studios, Wet'N Wild, and less than an hour from Tampa's Busch Gardens. So many things to do here, or just relax in the quiet and spacious setting of our vacation home. Pool heat is $15 per day extra and will be added to the final payment. Any stay less than 5 days will be charged a cleaning fee of $100.